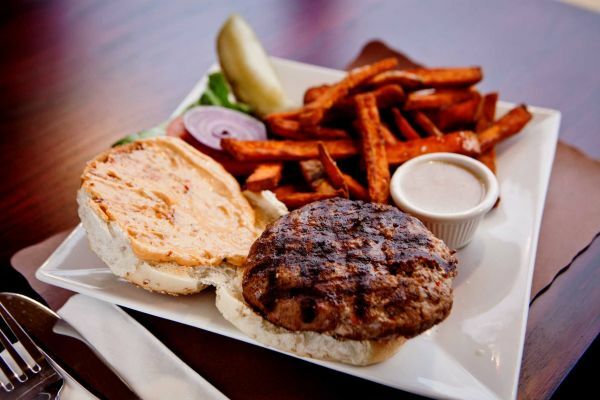 Grilling since 2001, John Henry’s American Pub is a local restaurant that serves burgers, wings, and salads. All of John Henry’s burgers are 1/2 lbs. They are grilled to perfection and served on a toasted roll with fries, coleslaw, lettuce, tomato, onion & pickle. The price of their burgers ranges from $10 – $12 which is a fair price because their serving portions are huge. As for the service, there are mix reviews, but for our experience, it was quite good. From the outside, the place looks like an ordinary town bar, but the atmosphere inside was quite decent. The decors and the complete design of the restaurant are very traditional, just like their menu. However, they make sure that they are the best at cooking traditional food. If you are traveling through the West End part of Long Beach, The Beach House is definitely worth a stop. Their Beach burger bar serves eight different kinds of burgers which includes turkey and veggie burgers. It is one of the local’s top picks because of its burgers and delicious waffle fries. The price range is $13-$15 which is a bit higher than the other restaurants that I’ve listed here. Their service is on point and the waiting time is quite short. The ambiance of the restaurant was perfect. As a bonus, you can relax and listen to live music as you enjoy your meal. ZinBurger is known for its famous Angus Burger and Samburger. Along with their famous burgers, ZinBurger also serves fries, salads, sides, floats, and shakes. If you come to this place you should definitely try their zucchini fries and fruit shakes. The price of their burgers ranges from $10-$15. This is an average price in comparison to the other restaurants on this list. For their burgers’ taste and size of the serving, this price is fairly decent. The service is really good and on point. The staff here is very friendly and accommodating. Also, the waiting time is only around 10-15 minutes, which is shorter than most restaurants. With its open-air atmosphere, the ambiance of this place is really good. They also offer patio and bar seats. This is a cool place to hang out with friends while eating burgers and drinking refreshing shakes. ZinBurger’s total concept is definitely a winner and once you have tried it, you would definitely come back for more. Established by the Loucas family, the Laurel Luncheonette and Restaurant has been serving delicious meals since 1932. Their premium burgers are made using prime Pat LaFrieda meats that are seared on a 700°F plancha & finished in our infra-red steakhouse broiler to seal the natural flavor in. They have 15 different burgers which are all served on a seeded brioche roll with sour pickle & slaw. You can also try their steaks and salads. The price range of their burgers is $7-$12 dollars which is a very affordable price. Their 80 years in the industry can be seen in the quality of their service and food. The place has a warm and welcoming ambiance. It is a good place to dine with your family. The options are endless with their burgers. They serve eight different burgers with an unlimited choice of free toppings. They also have delicious fries and other sides. Their prices range from $5-$7 which is the cheapest on our list and yet, the quality of their burgers are still good. They also have a good serving size. From the friendly greetings of the staff to the very accommodating manager, Five Guys definitely has an amazing customer service. You do not have to wait too long to taste the best burger in town. The place is really warm and inviting. It is definitely a restaurant that is worth a visit when you are on Long Island. Whether you are a local or a visitor in Long Island, the restaurants on this list are definitely worth a try. Visit one now, or better yet, do a burger-hunting road trip to experience the scrumptious taste of America’s favorite burgers in a new way.